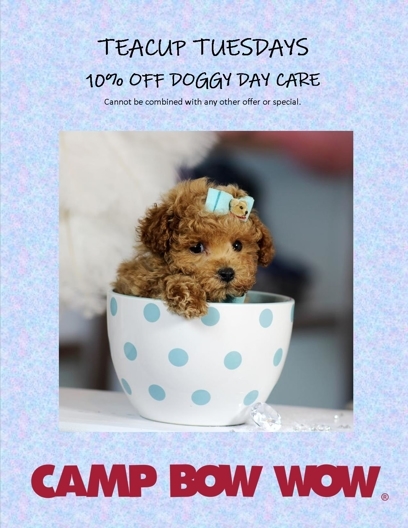 Camp Bow Wow® is a premier dog care provider that specializes in doggy day care, overnight boarding, and training programs. We provide trustworthy solutions for pet parents in Silverdale. Our large climate-controlled play yards are the perfect place for your pup to run, romp and socialize while you are away. Our overnight Campers will be treated to an evening treat and a cozy fleece bed. Safety is always at the forefront of our pet parents’ minds, which is why it’s always at the forefront of ours, too. You can rest easy knowing our Camp Counselors are trained and certified in pet CPR and pet first aid. Best of all, our live web cams allow you to check in on your furry family member from anywhere on your computer or mobile device. Come see what all the bark is about today. Contact us at (360) 813-3130 to schedule your pup’s interview. Get your first day free!